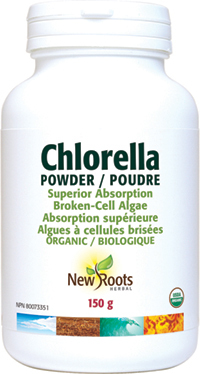 New Roots Herbal’s Chlorella is an excellent source of vitamins, minerals, amino acids, proteins, and critical nutrients. Our deep-green, broken-cell Chlorella pyrenoidosa is physically milled for maximum digestibility. New Roots Herbal’s broken-cell Chlorella pyrenoidosa is milled for maximum digestibility and assimilation of this natural, nutritional powerhouse. Adults: Take 1 teaspoon (2.5 g) twice daily mixed in with water or juice, with food, or as directed by your health-care practitioner. If you are taking other medications, take this product a few hours before or after them. Consult a health-care practitioner for use beyond 6 months.